Glenn Roberts plays trumpet regularly as associate principal trumpet with the Northern Symphonic Winds. He has also performed with the Orchestra of Northern New York, and for various choral festival orchestras throughout the St. Lawrence County area. Equally proficient in pit orchestras as well as concert band settings and orchestral music, he has performed as principal trumpet in 3 productions of the Community Performance Series summer musicals and in pit orchestras for many area high schools. He is also available to play church services. 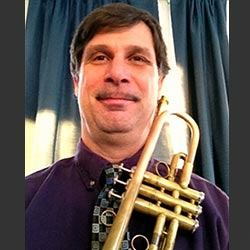 Glenn has a BM in music education and MM in trumpet performance from the Crane School of Music.